Mr Cookingfanatic has an extraordinary memory – although unable to remember anything he was taught in Science at school, he has an amazing capacity for remembering food. Particularly every meal he has eaten on every holiday he has ever been on. But the more mundane food memory unfortunately passes him by. When I sit down to do the online shopping order for the week, neither he nor I can remember 7 basic meals we eat. So it’s nice to have a new Lorraine Pascale book for inspiration. This recipe book goes with the series Fast, Fresh and Easy Food, so I’ve already cooked a few recipes, because I watched the series. 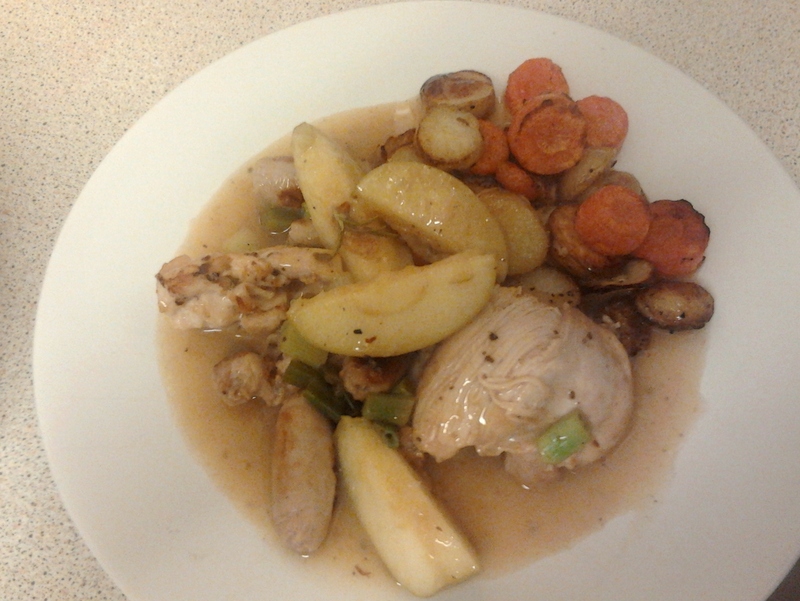 This last week, I cooked a couple of the main meals – Chicken Casserole, and Kedgeree. Unlike her earlier 2 recipe books, this one tells you the equipment you need at the start. 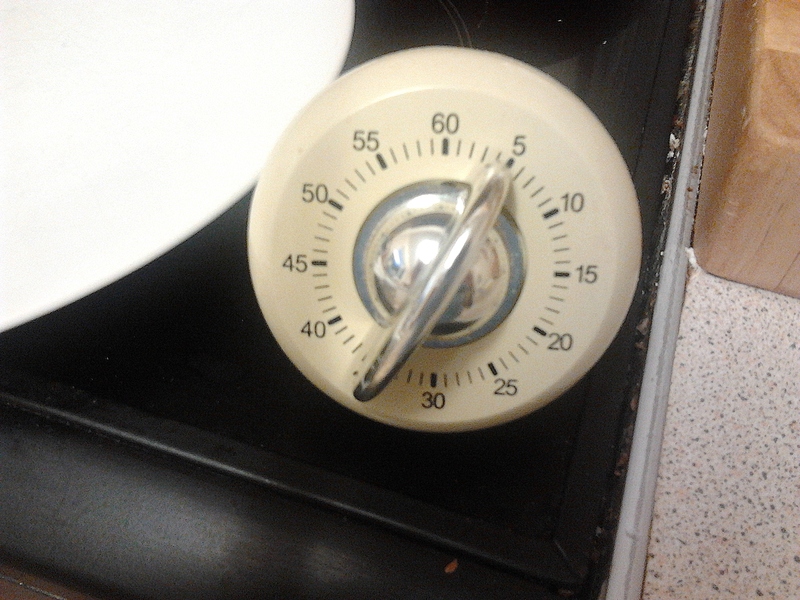 It also tells you how long the recipe should take. So I thought I’d test it out, and set the timer for 35 mins. 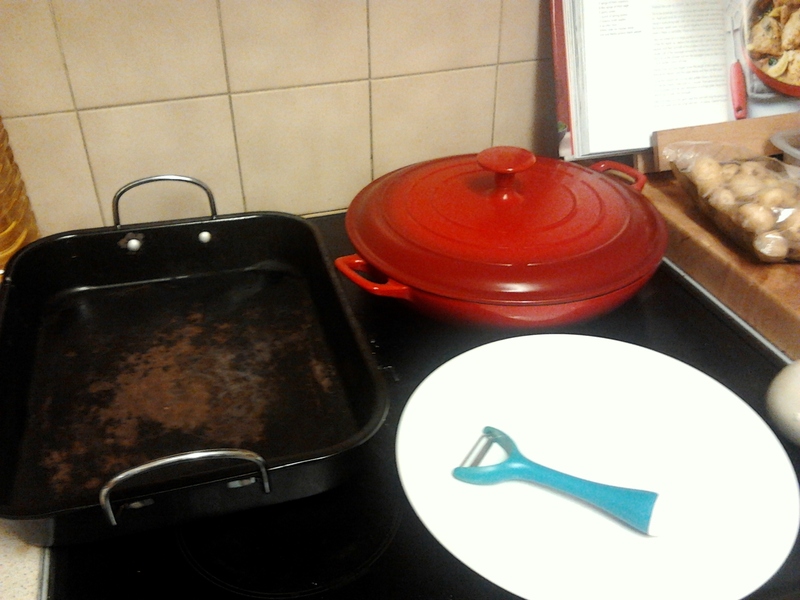 It turned out to be a little stressful, working against the ticking timer, and it took about 40 minutes in total, but I was trying to do some DIY with juniorcookingfanatic at the same time. 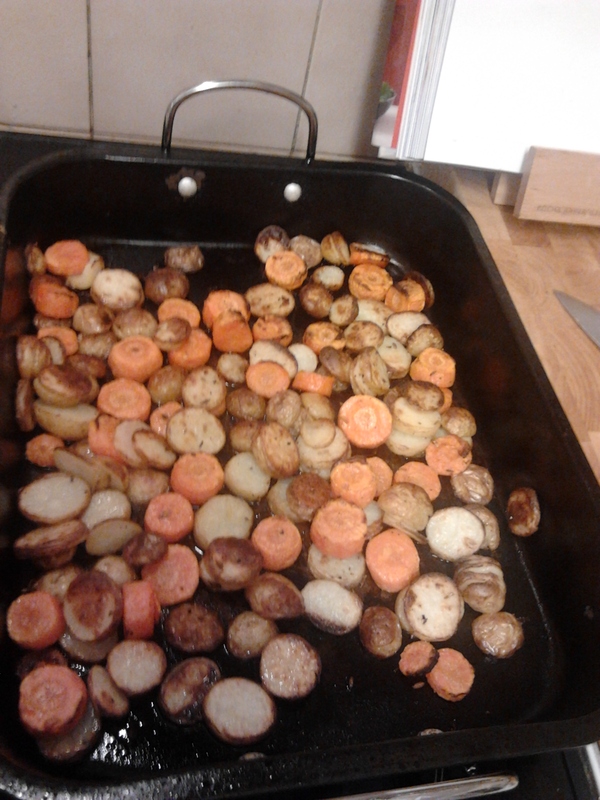 The accompaniment to the casserole is roasted sliced baby potatoes and carrots, which made a pleasant change from mash, which is what I’d normally plump for (plump seemed the apposite word for mash!). They roast for about 30 minutes, drizzled with oil and seasoned. 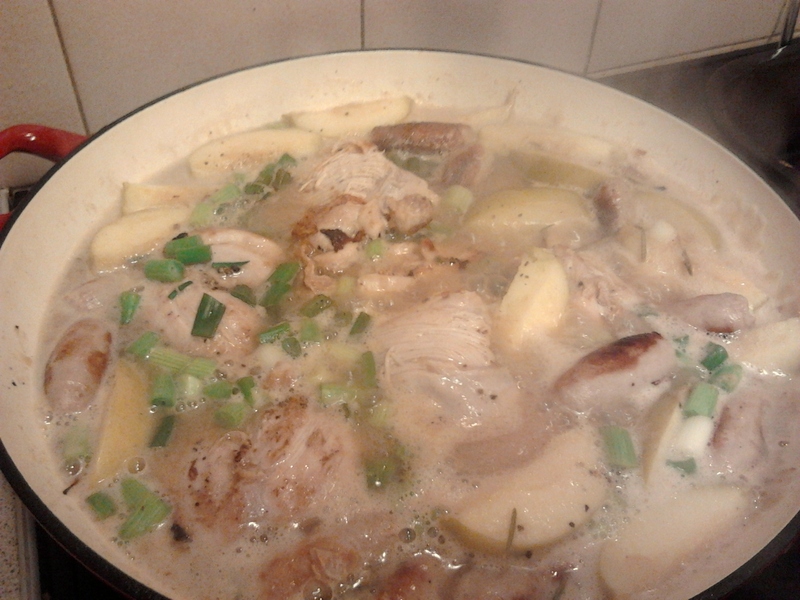 Meanwhile, the casserole uses chicken thighs, cocktail sausages, apple, sage, rosemary, spring onions, and cider. You brown the meat, make a little roux with the fat, and some flour, add the cider and let it bubble away until it begins to thicken. 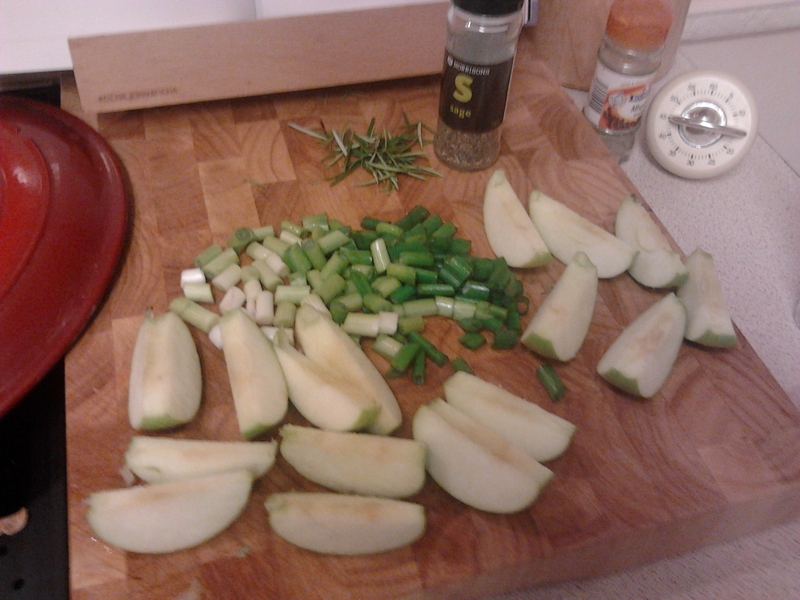 Then chuck in the other ingredients and leave to simmer. It’s a good, speedy casserole, and the cider sauce is lovely. 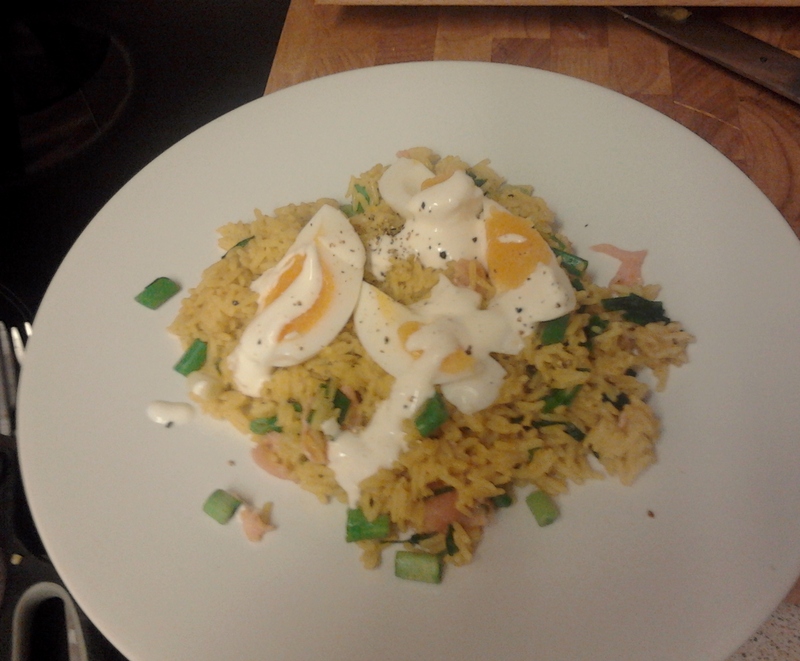 I also made this kedgeree for dinner one night, with boiled eggs, smoked salmon and a creme fraiche dressing. I am won over to kedgeree, though I still can’t imagine facing it for breakfast. Recipes page 116 and 180 of Lorraine Pascale’s Fast, Fresh and Easy Food. Previous PostPrevious Easter – all about the eggs?